The IRONMAN World Championship is one of the few racing venues where all athletes are weighed at registration. An unlucky few repeat that process when they hit the medical tent later in their racing day. No athlete plans their race by thinking “OK, body marking, check. Tires, check. Pre-race pee, good swim and then crash my bike so I end up with medical.” Right? I think it’s fair to say that none of the folks who actually end up partaking of the services offered by the medical team expected to end up there when their race day began. Racing triathlon is not an exact science. There’s a good deal you can do, however, to lessen your chances of an unplanned visit to medical just as you can plan your transitions thoroughly to require the least amount of time. If, well before the gun goes off signaling the start of your race, like the Pitjantjatjara you ”think your way through” the event, you’ll have a safer, more enjoyable day. One Sunday morning after a recent IRONMAN World Championship, I talked with one of the med tent docs about how things went from his perspective in the big tent next door to the King Kamehameha Hotel, aka IRONMAN Race Headquarters. His initial impression was that the harshness of that year’s race-day conditions led to both an increased number of “customers” and a setback in their arrival. In other words, as the day progressed and the famed ho’o Mumuku winds picked up, it began to take the athletes who needed medical help longer to reach the medical tent, which likely made their condition even worse by the time they arrived. The ferocity of the famed Hawaiian winds bearing that name, which roughly translated means “the winds that blow both ways,” are just one of life’s little pleasures on the rugged Kona coastline. These winds are how you can have a headwind both ways on an out-and-back course. A direct crosswind outbound really makes the bikers lean into it, and a quartering head wind inbound can make it so they even have to pedal going downhill on occasion. On this particular year, these winds were especially evident in the northern part of the island not far from Hawi, the halfway bike turnaround, which were later described by uber-coach Joe Friel “as bad as I‘ve ever seen it.” And he’s seen a lot. On this particular year’s race day, the breezes slowed the second half of the bike for many, putting athletes far behind their race plans. In fact, those who’d had a slow start to the day after encountering swells in Kailua Bay were the ones most affected. These were also the racers who could afford it the least, the older triathletes who generally spend more time on the course and could ill afford Mother Nature making an event more difficult than it already is. Things calmed down some by mid-morning race day but there were still many DNFs, particularly in the over 70 age group—including all the athletes in the 80+ age group, male and female alike. They credited the heinous winds for their slow progress. None of them made the bike cut off that year. Compare that to 2013 where four of the four 80-year-old elder statesmen finished, due to almost eerily calm conditions. Many of the age group course records were set in 2013 due to these conditions. When recalling the goings on in the med tent despite the particular rough conditions, this doc felt “there was nothing we couldn’t handle,” describing the expected dehydration, exhaustion, minor bike crashes, etc. It was also a testament to the harshness of the day that there were, somewhat unusually, 14 athletes receiving med tent care late into the night instead of the more common two or three. My best advice: Do your best to stay hydrated. But how? The pendulum has swung from “drink-drink-drink,” all the way back to “drink to thirst only,” and now, in my opinion, is settling somewhere in the middle. Suffice it to say that like most things in triathlon, if not in life itself, one size doesn’t fit all. We surveyed the athletes in Kona as they walked into bike check in 2016. Of those we surveyed, 14 percent said they would drink to thirst, 70 percent had a predesigned plan, which left about 16 percent believing they would do a mixture of plan and drinking to thirst. In general terms, drinking to thirst may be more appropriate for the slower athlete or an event where the conditions are less challenging. Use the early parts of a race for fluid and carbohydrate absorption, when later in the event, even though you may be thirsty, the gut may not absorb as much. Don’t drink excessively and use common sense with a long range goal of slight weight loss, say between 2 to 4 lbs, depending on your start weight by the finish line. You definitely want to avoid weight gain, a clear sign of over drinking. Remember that hydration starts before the race. We know that cardiac issues have claimed their share of victims over the years. 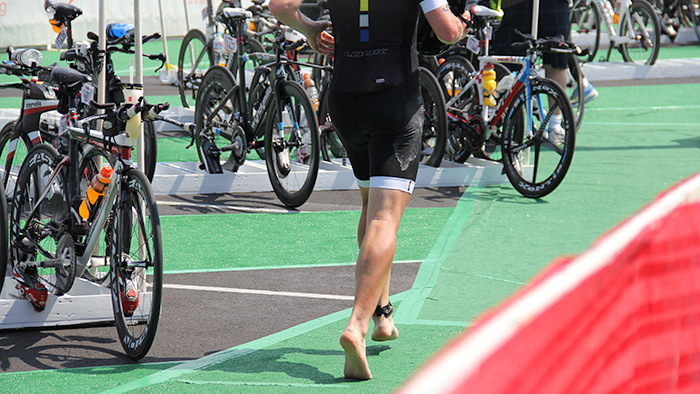 Statistics tell us that the most frequent sufferers are first time triathletes, and middle aged or older participants. Some would suggest that a pre-race cardiological clearance is always in good taste. As a physician, I’d have to say I agree with them on that point. Race within your own personal limitations, don’t allow the monotony of 112 miles on the bike get your guard down, and you’ll never know the sensations of lying on a cot watching the volunteer nurse trying to decide in which vein to start big bore IV. With perfect pre-race preparation, the next tent you see will be the one filled with food, smiles and finisher medals—not doctors. Dr. Post has a long history with triathlon including 6 Kona finishes and an Orthopedic Surgery practice in Virginia caring for, among others, injured triathletes. He now enjoys giving back to the sport by being the Medical Director of TrainingPeaks and being a World Championship Transitions volunteer every October. If you find yourself on the pier in Kona, please stop and say Hi to “the man in the red hat.” Dr. Post is available to help TrainingPeaks athletes and coaches with medical issues.